As we get older we like to differentiate between Passages and Living Abroad at a new destination. 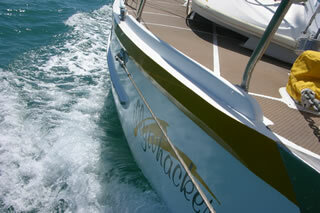 The passage stories related here illustrate how our style of cruising has changed with time. Starting with the high-speed journey of discovery around the world in our first yacht Dulcinea (1981-1983) to recent trips between each "new home", they describe the business of travelling under sail and the experiences of new landfalls. With each passage the joys, trepidation and anxieties of sailing live on but the pleasure of new friendships in a new country get better every time. Bring your gear aboard (don't forget your passport) and click on a passage.